Parallax is a term used to describe the appearance of an objects size from a moving perspective. In this way moving images can create spatial effects. 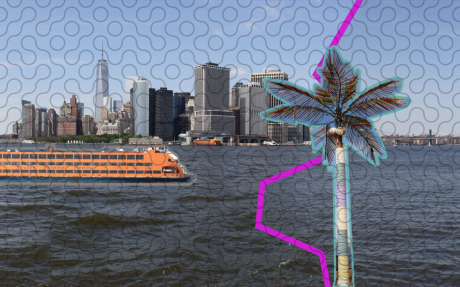 The Holocenter invited a number of artists to create projection installations that meditate on the concept of parallax and the psychogeographical experience of Governors Island. Historically, Governor’s Island provided a site to stage international events and military presence. Presently, it hosts domestic events in the public service. 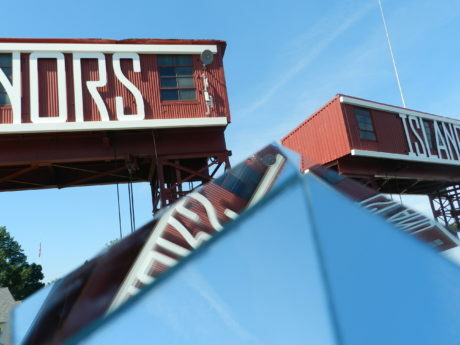 As an installation, Merry Times plays with the island’s mutable purpose, providing an idealized panoramic view from a patchwork of maritime imagery and sounds. Blending layers of decoupaged images and a glossing pattern, the projections pull from hyperlocal images, mathematical periodicity and the puzzled patternmaking of truchet tiling, alluding to the layered craft of composing history relative to place, where no snapshot view is ever identical to precedent. It applies photo, pattern, and parallax to a scene that swoons and swells with the passage of time, and invites the viewer to witness that pendulum progression around the island from a paradoxically static position. Acknowledging the timelessness of an island with layered history, Merry Times invites viewers to immerse themselves in this sense of simultaneous position, presence, and parallax displacement. Aurelia Moser is a librarian and developer based in New York and Nairobi. With a background in chemistry and codewriting, cataloging and art archiving, she makes work related to art history, data transparency, and information design. As a code-cartographer at Ushahidi and Internews-Kenya, and an advocate for global code curricula, she balances experience in design, dev and data-journo departments. I travel to many places and everywhere I go I carry my travel companion: Baby Sky Mountain. I always take snapshots of the landscapes I see with Baby Sky Mountain in the frame. This piece captures the surrounding world like a patched landscape sculpture. The most exciting part of working with photographs is playing with the scale of Baby Sky Mountain: sometimes it looks giant and other times very small, depending on the composition of the picture. This mirrored object shows how different things happening in one moment can be captured in one picture. Artist Statement: Currently, I make my work using reflective material and light. In the case of my outdoor pieces, I capture different “colorscapes” depending on the time of day. These reflective materials patch together and create new landscapes out of their natural surroundings. The relationship between my work and my interest in reflection is the most exciting part of my creative research. Like sound, memory, feeling and imagination, light is intangible and invisible, but its effect on our lives is profound. My interest in creating works with light is in experiencing the phenomenon of their visual qualities as well as in the creation of a relaxing and sublime space. 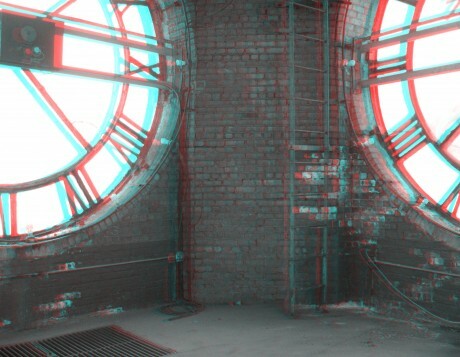 AROUND THE CLOCK is a 3D video loop, created from 16 stereoscopic images captured inside the clock chamber atop the Center for Holographic Arts’ former home: a magnificent 1927 Art Deco tower in Long Island City, Queens. The image sequence moves rhythmically around the age-worn interior, exposing stained brickwork, the cracked glass of the four massive clock faces, and the general toll of nine decades. As the arc closes and another orbit begins, viewers may contemplate the relations between space — articulated here in trifold fullness — and time — reduced here to a quantum pulse; and the tension between time’s linearity — the unswerving arrow of change and decay — and its circularity — the renewal promised by each sweep of hands round the dial, each cycle of light and darkness. To chart a course, across distance or duration, one must first take one’s bearings. AROUND THE CLOCK offers a singular experience of grounding in four dimensions, and a rare vantage point: from the hidden center of constructed space, on the inner side of divided time. Governors Island is naturally positioned for military use, yet aside from Castle Clinton the grounds have the look and layout of “Anyplace, USA” and is currently morphing into a new harbor for the arts that is open to the public. 3D filmmaker Carlton Bright offers Eternal Now with an element of visual Magical Realism that will reflect Governors Island’s current and rapid transformation from a military to an artistic presence in the cosmopolitan setting of New York City. Bright will blend a light painting element inspired by artist Vicki DaSilva with subtle editing into the 3D footage that was captured on the front lawn of the Holocenter on the opening day of the Governors Island 2014 season. Parallax provides the means to perceive depth from two images taken from different viewpoints. Simply moving the camera and taking a second picture is the simplest way to capture 3D. 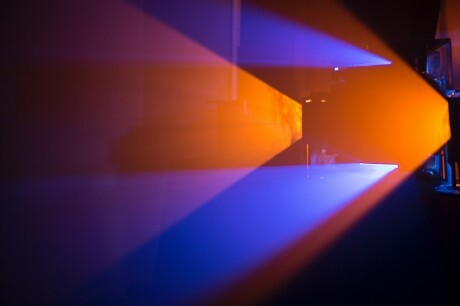 Under certain conditions, if the camera moves while the shutter remains open, the light creates a unique and colorful 2D pattern on the sensor (or film). “Dimensional Life Light” combines 3D video with 2D light photos to create a unique lightscape. The piece is the most recent in a collaborative series by Peter Rogina and Eileen Cohen. Vibrations and waves are among the most fundamental phenomenon in the Universe. They make up everything within and around you, both physically and metaphorically. 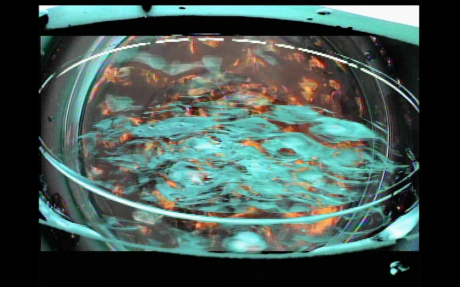 Using cymatics (visible sound) and experimental video, Vibrations in Parallax examines vibrations and waves along various lines of sight and scale of time. The piece begins with video of a sine wave at 150Hz (vibrations per second), and descends past the threshold of human hearing (20Hz), dropping all the way to zero. The work then proceeds through a piece of visual music, performed around a series of cymatic drones below or slightly above 20Hz. 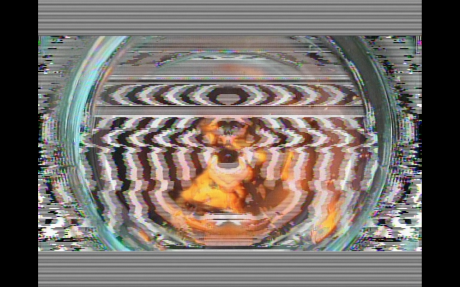 Various video tools such as multiple camera angles, video mixing, video feedback, and circuit bent video are used for visuals. A subwoofer is also included in the installation, adding these subtle tones to the projection. As serendipity would have it, the artist’s cat happened upon this little island of vibration during filming, and couldn’t resist drinking from the artwork. This portion of the work is dedicated to Molly Brown, the brave and lucky cat who washed up on Governor’s Island in May of 2011. Molly’s origin is unclear, as is how she survived a trip across New York Harbor. Theories suggest she may have come from New Jersey or Brooklyn, and that she either swam or floated across on a piece of debris. Upon her discovery by workers on Governor’s Island, she was taken into safety. The original owner could not be found, and an online poll was announced to choose a new name. A final vote decided on Molly Brown, in honor of the Unsinkable Molly Brown, who heroically saved lives on the Titanic as it was sinking. A member of the boat crew on the island took Molly the cat in, and she is now living in sunny Florida after they moved. Steve Pavlovsky is a multidisciplinary artist, who is best known for his work as Liquid Light Lab. 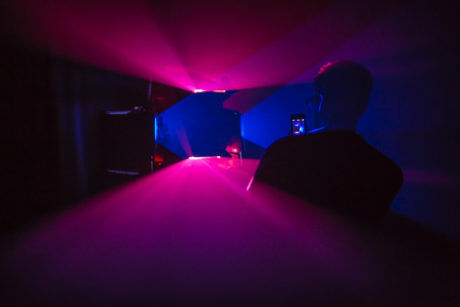 Liquid Light Lab is an old school, hand made light show and live visuals performance. Steve considers the light show the fifth member of the band, and a philosophy of real time visual expression of music is fundamental to the work. He has accompanied numerous internationally and nationally acclaimed musicians, including The Zombies, Brian Jonestown Massacre, Antibalas, The War on Drugs, Roky Erickson of the 13th Floor Elevators, The Black Angels, The Jon Spencer Blues Explosion, Ivan Neville’s Dumpstaphunk, The New Rider’s of the Purple Sage, and Chali 2na of Jurassic 5. He has also performed at music festivals such as Mountain Jam and Austin Psych Fest, and works with community groups such as the Police Athletic League of Harlem. New Projection 1 is an investigation into alternative projection methods. Bringing the projector center stage, this kinetic mirrored sculpture presents an immersive abstract video projection experience for the viewer. Julian Bozeman is an artist and musician living in Brooklyn, New York. He has performed music and exhibited artwork internationally at venues and events such as The Clocktower Gallery, Old School Gallery, Strelka Moscow, Issue Project Room, Center for Advancement of Contemporary Arts, All Tomorrow’s Parties, and Mona Foma Festival. He has received grants from entities such as mediaThe Foundation, Jerome Foundation, Rasmuson Foundation, Juneau Arts and Humanities Council, and Los Angeles Museum of Contemporary Art. 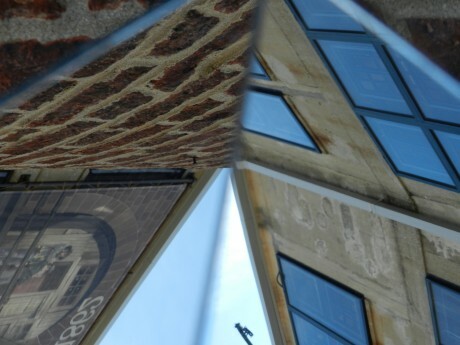 This first collaboration between photographers Glenn Amico and Peter Emerick and media artist Erik Sanner developed around the concept of “point of view”. Each individually portrayed and interpreted the traffic cone in their own way for years before examining and presenting traffic cones together. The artists wandered the entirety of Governor’s Island and captured still and moving images of the many traffic cones they encountered. The traffic cone can be viewed in a number of ways – for example as a warning, as a nuisance, or as a ready-made sculpture. As there is no correct way to view a landscape, so there is no incorrect way to look at, represent or present a traffic cone. 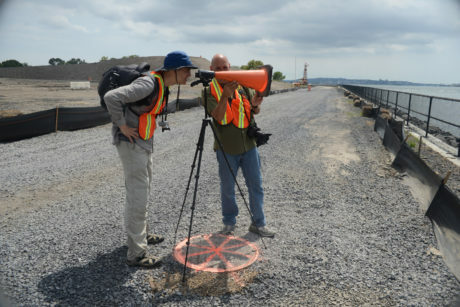 However there are invariably different ways to do so, and the artists have endeavored in integrate various methods of traffic cone viewing into their installation. 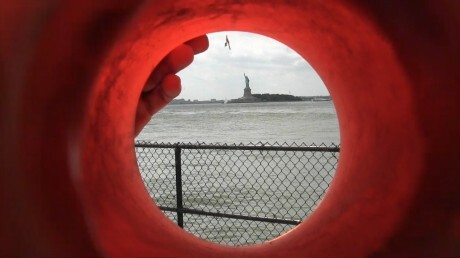 Video of the Statue of Liberty as shot through a cone used as a framing device, top-down photographs of cones in which they appear as circles framed by rounded squares, and images of cones photographed while lying in the grass looking up at them looming over the camera are just a few of the ways cones are seen in this work. A hologram appears to shift as the viewer’s gaze changes position. The viewer is encouraged to consider traffic cones as art, as obstruction, as helpful warning, and as many other ways as there are points of view. Erik Sanner is a visual artist living and working in Harlem, NYC. He has recently exhibited at Tria Gallery (NYC), the Courtauld Institute of Art (London), LICHT FELD (Basel), the Danforth Museum (Massachusetts), and Carmichael Gallery (LA). 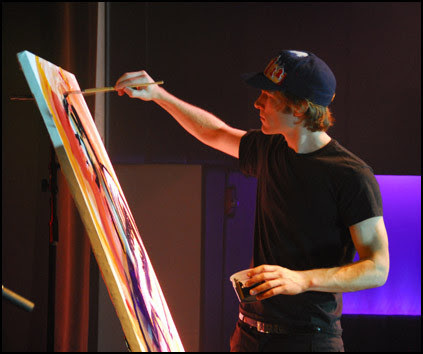 Sanner’s overarching goals include expanding our experience of painting by utilizing technology, promoting awareness of traffic cone aesthetics, and collaborating with artists and non-artists alike to realize projects no individual would have imagined or executed without sharing their visions and cooperating together. Peter Emerick is a photographer working out of Jersey City, N.J. He has shown his work throughout South Korea and the United States and is co-founder with Erik Sanner of the Traffic Cone Occasional. His series “Koans” is a body of work centering on aerial views of traffic cones and is about seeing and about looking, the basis of Photography. As Ansel Adams photographed the landscape of America, Emerick is photographing the traffic cones of America. While the subject matter is amazingly different the intent of each artist is the same: to focus on the chosen subject and explore it fully in order to discover the similarities as well as the differences. Glenn Amico is a photographer born and bred in NYC. His most recent exhibition was at the Soho Arthouse (NYC) in May 2014. After his retirement from the NYPD Amico decided that he wanted to spend a great deal of his time interpreting and delivering the extreme everyday beauty most walk by without notice. Traffic cones are one of his main subjects. It’s hard to do a light installation on Governors Island and not recall Anthony McCall’s monumental work, This World & Nearer Ones, 2009. While McCall’s work–and certainly James Turrell and others before him–use light to create virtually solid forms in space, with this piece I am interested in extending this notion by using light to create a form that conveys information. While the “information” being conveyed is of the most rudimentary sort–i.e., that of a specific shape–it represents the first step in a future series in which light itself becomes somehow informational. After growing up on Long Island, Eric Corriel graduated from Cornell University where he received a Bachelors of Arts in Philosophy while also studying Fine Art and Computer Science. He later received a Diplôme National d’Arts Plastiques (National Diploma of Fine Art), the equivalent of an MFA, focusing on Digital Art, from the École Régionale Supérieure d’Expression Plastique in Lille, France. Currently living in Brooklyn, Eric takes the urban landscape as a medium in which to create site-specific video installations in the public realm. He is also the Lead Web Designer and Developer for the School of Visual Arts in New York City. For his artwork, Eric has been awarded by the New York Foundation of the Arts, New York Council for the Arts, and the Public Art Network. As a web designer and developer he has received awards from the Webbys, Davey Awards, and W3. I came to know Parallax during a misunderstanding while training in photography. Some cameras will exhibit inaccurate representation of an object due to any discrepancy between the plane of focus and that of the subject. This phenomenon has a similarity in its concern for movement, because the tilting and swinging of a bellows camera can lead to perspective correction. Allowing this confusion as a point of departure, my investigation of Governor’s Island was specifically focused on the infrastructure housing the Holocenter and how the shape of the projection room can distort the perspective of thrown light. This approach served to define the form of the project, whereas the content is an animation that considers movement in a way that doesn’t obscure the source subject as expected but instead in a way that results from programming and mapping. The found data serving as the source material deals with frailty and decay, relating more to the island than to optics or illusions. TJ Hospodar (b. 1977, Ohio) is a mathematician with an artistic practice. Based in New York, TJ focuses on information science, photography and performance to create objects, environments and circumstances. His particular interest in hospitality is evident in work regarding concepts of hotel theory, such as Hotel Savoy (PS122/Goethe Institut), Boardroom Bed & Breakfast (Open Center) and Boggsville Boatel (Flux Factory); of transportation, such as Commuter Assistance (The Work Office), Museum of Car Service and Mobile Library (PepeNero/GAP) planned for November; and of meal-sharing, such as Soup Kitchen (The Work Office), Foodworks (Sumei), Pierogi Party (3B) and ongoing exercises in Dinner Theatre with partner 0h10m1ke. His work has been mentioned in the New York Times and the BBC, and it has been exhibited in the United States, Germany, and planned for Italy in November. This combination of video art and live painting is my representation of Parallax. I’ll be projecting a prepared video that travels through New York City onto a blank canvas and tracing the images. 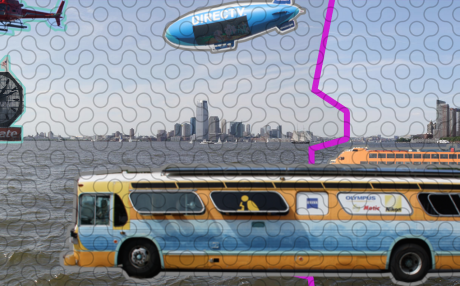 The resulting canvas will be hundreds of layers of images of the city superimposed on each other. The traveling shot in the video will have a common horizon line- the camera will remain at the same height above the ground and look straight ahead. This will give the image a cohesive space. Since the painting is an improvised performance piece, I can’t predict exactly what it will look like. But my hope is that it will be so complex that the viewer will forget about windows and buildings and streets and think only about time and space in perspective.